That’s interesting, have you understood why? Like Martin I’ve had a Tortoise apart and although by looking I wouldn’t condemn them out of hand, my experience says there is something wrong with the design both from my experience and those of others. Have you taken one of the Cobalts apart to see why they seem better? Andrew For the record, apart from the fact that I find them noisy, I've not had any problem with the switching on my tortoises. I do take trouble to make sure that when the tortoise is in mid travel the switch blades are also in mid position. 1. plain copper is not a satisfactory contact material for other than very low currents. The Tortoise switches use phosphor-bronze wipers running along tracks of thin copper foil on the printed circuit board. If you can guarantee that you will never switch into a short-circuit condition, they are probably acceptable. That would happen for example if a loco or just a metal wheel is left bridging an isolation gap in the rails, with power on, and the points are then reversed against it. What then happens is that the full short-circuit current passes through the copper track as the wiper makes contact with it (until the short-circuit protection operates). The thin copper is very likely to be burnt and permanently damaged. Future operation of the contacts will be degraded, probably leading to a high-resistance contact instead of zero. 2. the actual design of the printed circuit board is very poor, with the tracks misaligned with the wipers. Andrew Jukes went so far as to have new circuit boards made for his Tortoise point motors. I believe the Tortoise circuit boards have since been through several design revisions by the manufacturers. That is indicative of the problem, and it is not easy to know if you are buying fresh stock. 3. contact pressure relies on the Tortoise motors being used in stall mode, i.e. the current remains on permanently in each position. As simple point motors they will operate the points just fine if you choose instead to switch the power off after movement is complete. This saves on power consumption and eliminates the slight buzzing noise from the stalled motors. However, if you do that, the back pressure from the points linkage causes the plastic drive arm to twist slightly, lifting the wipers from the copper tracks. Some have argued that this is not a fair criticism, because the Tortoise motors are intended to be used in stall mode, as indicated in their instructions. I would argue that it is indicative of the poor design of these switches, and limits a useful way of using the Tortoise point motors. One user I know, to operate his Tortoise motors, would connect the required one to the loco controller (DC) with a simple on-off switch, drive the points across visually using the loco controller, and then switch it off. It worked fine as a simple method of operating the points, needing no extra power supply or double-pole switches -- but failed because of the failure of the internal polarity switches to maintain contact with the power off. Very clear succinct answer thank you. The only bit I didn’t understand was the reference to the two different types of Cobalt. Are you referring to the ordinary and DDC ready types? DCC concepts tend to love their own marketing speak , so you gets lots of it ! The Analog IP is basically a V2.0 version of the omega , with improved power supply range ,microprocessor control of the motor , and improved contacts , it’s easily worth the extra 2 quid or so, in fact I wonder why DCC concepts keep the omega in the range . ( the difference is nearly nothing if you buy the 6 pack ) It also cuts off the motor at the end of the movement removing one of the big issues with the Omega , which is the high stall current , so unlike the Omega , the IP isn’t actually a stall type PM at all. Which don't need petrol, and don't drive on the wrong side of the road if they lose the GPS signal. Here is an interesting picture, from the above Movietone newsreel clip showing (allegedly?) 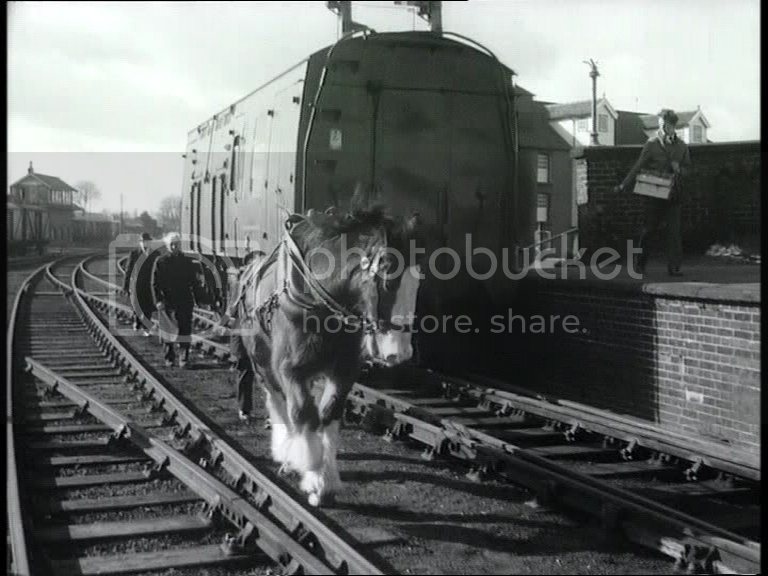 the last working shunting horse on BR, filmed on 27th Feb 1967. Notice the catch points in the foreground -- the turnout rail is chaired on alternate timbers only. The only reason I can think for this is economy of chair castings. This may be a one-off for this location (Newmarket) or maybe typical of GER / LNER practice generally -- anyone know? For some reason the meaning of Henry Ford quote eluded me. It took my French wife ( and it’s a well known fact that the French have no sense of humour) to explain to me what Dave was saying! Which made us both chuckle, me at both myself for not understanding it in the first place and at Dave’s wit. Your response brought further amusement at the kitchen table this morning. Thus disproving my previous statement about the French;a very entertaining way start a Saturday morning. Thanks to you both. A little bit of progress on the electrics front. I’ve installed and tested with my ZTC 511 and it’s 5 amp power supply, three of the Gaugemaster Autofrogs and they seem very smooth in changing over the polarity. That is to say that running a loco dead slow over the crossing there doesn’t appear to be any hesitation as it hits the opposite polarity. Will they last the course, would it have been better to employ Tam Valley frog juicers, or should I have used relays as I did on the junction board? Only time and using them will tell. Here’s a picture or two of how i installed them. They come unwired and with just three solder pads on the underside, two to connect to the track power and one for the crossing itself. Not wanting to solder them in directly to the layout wiring I soldered three short wires from the pads which then go to a Chocolate Block strip double sided to the top of the Autofrog. I also double sided the Autofrog to the baseboard. Then I connected the three wires that had gone to the micro switch to the Chocolate Block strip on top of the Autofrog. And that is the job done really. If they fail then I can remove and replace them easily. To do this testing incidentally I’ve been trying to convert a Buffalo pannier to EM but it’s not running as well as it used to as an OO model. I thought it would be an easy conversion having outside frames all I need to do is to push the wheels out on on their axels and insert some fibre washers cut open just enough to allow their installation, extend the brake block lateral spacing and that would be it. It wasn’t quite that simple and as I say the running is quite up to scratch as yet. When I’ve got it sorted I’ll post a video of it working( very exciting! ) if some kind soul would would tell me how to put a video up? Sorry, just one picture as it turns out. Sometimes I think I’ve got the hang of resizing and uploading, then it all goes to pot and the computer shows who’s really in charge. This is the picture of the Autofrog installed, to state the obvious. Hello Can anyone tell me how to upload a video preferably without involving YouTube as I don’t have an account with them. You need an account somewhere in order to upload a video. Unless it's a very short clip in a format supported as an attachment here. (SWF, GIF, MP4, FBR). 10MB max. YouTube is the easiest to use. If you don't want to create a YouTube account yourself, send it to me as an email attachment, and I will upload it to the Templot YouTube channel for you. (This means you will lose the option to edit it yourself.) Email success will depend on the file size. To see my email address, click my name on the left, and Profile. Thanks for the offer of uploading a video. I did try to send one to you this evening but it didn’t go so I suspect the file size was the reason. I’ll get someone at work to show me what to do to use YouTube instead. Thanks again and I loved the photo of the style( I presume?) and church. How big is the file? What type of file is it, e.g. MP4, MOV, WMV? If it's not too big I may be able to make a temporary change to the attachment settings to allow you to post it here. Yes, it's a stile, although not much used then as you can see -- that was a few years ago. p.s. edit: just checked -- "a few years" turns out to be 16, that was June 2002. Where do they all go? Thanks for the offer of doing this. Its a MOV file and its about 40mb which is surprising as its only 39 seconds. Will the site accept a file of this size? I don't know for sure, without getting advice from Jim. However, I have now added mov and MOV to the allowable types and temporarily increased the size limit to 80 million bytes (about 76MB). Give it a try, nothing to lose if it fails. No it’s said error invalid file. Tried three times. Unless you’ve any other ideas it’s back to some bright spark giving me a lesson in YouTube. [Edit] Well this is my first experience of uploading a video on YouTube and in Templot. Another string to my bow! Having said that it’s turned out a very narrow picture...? I’ve done a very rough conversion on this loco ( no rebuilt chassis I'm afraid) by just putting washers in the space created by the wider gauge but with its outside frames the narrow chassis isn’t too obvious. I haven’t finished the job as it’s missing it’s brake gear and lost a front sanding pipe in the struggle to push the back to back out to 16.5mm so that needs restoring as well. You seem to have cracked YouTube. It's narrow because you probably recorded it on a smartphone held upright? YouTube has then fitted it into its standard 16:9 landscape-format frame. If you had turned your phone on its side, it would probably have filled the frame better. If you do that, make sure it is not upside down -- the camera lens on the back should be at the top. Having said all that, YouTube is a law unto itself and not always predictable. p.s. if you are widening RTR wheels for EM, it is better to set 16.4mm back-to-back rather than 16.5mm (which is for EMGS wheels). Thanks for the tip on the phone. I'll try it out and let you know. As to the wheels they are Alan Gibson wheels that I have largely standardised on and the loco is one of his as well. A very nice kit with a mixture of white metal, nickel silver and brass which as a layout loco is good for me particularly on my old layout of Maiden Newton / Yeovil in 00 there were sharp curves and steep gradients and the weight of the white metal really helped the loco's pulling power. I've got three of them, one open cab as on the video, a closed backed cab, both of which are panniers(based in Yeovil in the early 20's and a third, yet to be built, in saddle tank format...gorgeous. So coming back to your thought on back to back I take it that 16.5 is correct for Gibson and the odd Ultrascale wheel? Below is a video of me testing out baseboard no 5 of YPMill and final fettling apart I’m pleased to say it worked pretty well straight away. You may well notice the loco jumping over some of the crossings but only the rear drivers appear effected. In this model that is the fixed wheel with the others compensated with traditional Sharman three point compensation. So I think it likely that the back to back on the rear drivers is a little tight. It may get a bit boring watching it go back and forth, back and forth but I wanted to demonstrate to myself that I could build track that worked and just in case it stops working between now and whenever it’s taken for a run next, that i did have it working on the 20th October 2018! So celebabrations t one side what I haven’t yet even really thought about is the signalling. I say not thought about, I really mean planned properly. I’ve got the Megapoints board installed ready to control them but I haven’t worked out how to build them. So far I’ve thought I’d mount them on a rectangular brass base plate with a copper or brass tube soldered to the underside that would go through a close fitting hole in the baseboard and also serve as the mount for the signal and the frame for the servo(s)to be held in. The benefit of this is to have a design that can just lift out of the baseboard without any fiddling underneath ( other than to unplug it electrically). Has anyone experience of building signals that unplug like this. Steve Hewitt is building beautiful signals over on RMweb but his require access underneath. I want to be able to set up a signal whilst still on the workbench. I’m sure I’ve seen somewhere an article on building them as I describe above but I can’t remember where it was or when. Can anyone point me in the right direction? There is some sound but it’s towards the end of the video. The slight bump going over some crossings just might be the crossing rather than the rear drivers. Might. Remember bumps involving the fixed axle are likely to be more noticeable than the rocking drivers. Like the idea for signals. I do something like that, maybe the way Steve Hewitt does it? I have a plasticard top plate (easily buried under ballast) and a plastruct tube glued vertically to it, which slots into a hole in the baseboard. The signal, including post and ladder, is built up from the top plate and is installed as a unit. But the servos are mounted and adjusted separately underneath the baseboard. The signal posts are plastic (Ratio or similar) which is why the base plate etc is plastic. It’s interesting you using plastic for a plastic signal kit. As a matter of interest what diameter is the tube? For speed Ive wondered about using Ratio as they are pretty good models and a lot quicker than using MSE parts. Maybe I should try one out see how it looks. On the other hand I’ve used MSE and Springside in the past though and my concern is they may not be quite what I’m looking for. Can't find the tube I used but I'm pretty sure it was 10mm. This was for 3mm/ft scale. I used Ratio because at the time signal components such as final and lamps weren't readily available through the 3mm Society. So the signal post is slightly too thick, but not noticeable. I cut the post to the height I wanted. The final and lamp were trimmed to a more reasonable size using a scalpel. The arms and balance arms were from a 3mm scale fret from Worsley works. After connect the signal arm to the balance arm using nickel silver rod, another bit of rod went from the balance arm down through a small hole in the plasticard base and then through the tube down to the servo. If I was doing it now, I'd adopt a similar approach, but use finials and lamps from Modelu and a correct thickness plastic signal post from the 3mm Society. Thanks for the extra info on your signals. I must say I’d always thought I’d be building mine with a brass base but your use of plastic is making me wonder about it as an alternative , especially if I use Ratio. And this especially if I end up using the really mini servos which are about the size of my thumb nail to operate signals, as they might fit in a 10 - 15mm tube. And I may be able to just glue them in place as you’ll see in my next post with a standard servo. Needs some more thought and experimentation. This is board no 3 at the southern or left hand end of the station. I’m xperimenting with this board in having as much as possible of the wiring and point controls on the surface rather then underneath. So there’s a servo stuck to a piece of plasticard ( to act as the base that I can screw to the baseboard) which I’m hoping to hide under the platforms and I’ve cut trenches through the cork for both the wire in a tube control from servo to turnout, and trenches for the wiring runs to the various sections / districts. When I’ve installed the wiring and turnout controls and “made good” then I’ll make a start on laying sleepers as I have previously. But this time I must remember to give the plan a wash of brown paint to kill the white. Without that any defect in the ballast shows up white like a sore thumb. At this stage I’m still thinking I’ll keep the servo wiring subterranean and again as far away from the traction power as possible. Not that I’ve experienced any problems ( so far) with board no5 when testing it out, but that was only one loco trundling up and down. Time will tell on that one. Have you been able to try any serious train movements with the servos in operation? Serious movements? I'm not sure what youre thinking of , but quite possibly not, just the Buffalo wandering up and down the no 5 board as in the video above. At present I don't have any other stock to test it out with as they are all still in 00 from my old Pen Mill / Maiden Newton layout! The movements in that video are quite a good test. If you didn't see any strange servo behavior there's a good chance you won't have any problems. You might make the test conditions a bit more difficult if you can simulate intermittent connection between the wheels and rails. That tends to generate some pretty impressive bursts of interference. I’ll give it a go when I next have a chance to get that board back on the table again. For the moment it onto board no 3. Talking of which I’ve just installed any surface wiring that needs to go down before I start laying sleepers, in other words any wires that go under sleepers. And I’ve been thinking how to join the operating wire from the servo to turnout tiebar and wondering how to get an omega loop or equivalent into the mix to prevent overdriving. By chance I came across Leeds City the Midland side on RM web. This one very impressive layout and John the builder surface mounts his servos as I’m doing and connects his operating wire in such a way as to give some slack. I’ll take a photo soon of my copy of his elegant solution. Here’s a photo of board 3 almost ready for sleeper laying to commence with the servos just laid in their approximate positions. They are under the platforms mostly or the road bridge. I like the fact that you are mounting them "topside". BTW, the more slack you can put in the connection the better. That will increase the servo rotation which will reduce the tendency for the points to back-drive the servo. Ideally you'd like the servo to rotate through something like 120 degrees. I believe the latest version of the Megapoints controller stops sending pulses after a second or so. That reduces the probability of interference changing its position but it also means that the servo won't fight to maintain its position. Torque applied to the servo's horns can make it rotate, particularly if there is a lot of vibration. Increasing the angle of rotation reduces the torque. Andrew Barrowman wrote: Sounds good Andrew. Thanks for your encouragement and thoughts on servo drives, angles and so on. Without the microswitches that I originally had on the previous board (no5) and,as you know, subsequently removed, there shouldn’t be much if any inclination for my switches to back drive as they’re loose heeled. I use a 10BA nut soldered to the underside of the “hinge sleeper” and countersunk 10BA bolt with the head filed down to act as the loosely bolted fishplate. This photo should help explain what I mean I hope? Theoretically at least they will just blow around in the wind. There’s another photo or two on page one of this thread that shows a bit more. And yes your quite tight about the Megapoints controllers. They no longer chatter to each other which is a considerable relief. The first board I built ( junction board no 2) and fitted the Megapoints board, has the earlier version and they talk incessantly. However Dave Fenton at Megapoints does an upgrade service,for a fiver I think, which I shall avail myself of at some point! "does an upgrade service,for a fiver"
It's probably best if I don't say what I think about that on social media. Andrew Barrowman wrote: "does an upgrade service,for a fiver"
Sounds like I’ve hit a sore point? That certainly wasn’t my intention. Let me know if I can clarify anything, as I’m unsure what it is that surprised you. I think it might be that charging to make the unit do what it really should have been doing already is a bit cheeky. FraserSmith wrote: I think it might be that charging to make the unit do what it really should have been doing already is a bit cheeky. I have to admit to knowing very little about electronics but I thought it was standard practice for servo controllers to constantly check on the servo position and hence the chatter when it moved it back where it should be....or something like that? So should it have not chattered in the first place? Might this be a debatable point? What I’d say about Dave Fenton and his products are that they do what they say on the tin. Whenever I’ve had a question he’s answered it very fully and has been generally helpful. He also has a raft of easy to understand videos on his website which are very clear. Designed and made in this country. Megapoints have a lot to recommend them I think. So a fiver for an update....? Servos seem like a good idea, but there there are quite a few reasons why they are not a good idea on a model railway. But that's not to say you'll have any problems with them. Probably best to run a lot of tests before you get too far into the build. Let’s hope my initial tests are a good omen! Heres a little more progress on board no 3. Sleepers laid, barring the copper clad hinge sleepers for the loose heeled switches, the material for which I have just ordered. One the cats has walked off with one my eight servos, so I’m down to seven now, impressive maths. And if it wasn’t one of the cats or a human then I suppose it’ll be me having left it somewhere....but where? As an aside I went to Scaleforum last month with, amongst other intentions, of buying one of the Mk1 society lever frames. At the same time I wanted to see Howard Bolton’s 70 lever frame in the flesh and to see the new Mk2 to understand what “all the fuss” was about. Well in true Bolton style he has done a superb job of improving on the original which I had thought was a very good product( I built 5 of them for my old layout and thoroughly enjoyed the experience). So as you’ve probably guessed, despite my best intentions I came away with the etches for the Mk2. So this aside came about as I’ve just spent an enjoyable half hour reading the very full instructions that accompany the kit. I can’t wait to get started...but I think I’d better build some more track before I get distracted down the seductive etched kit road. Before I go much further I must stick the track plan to the underside of the baseboard. I’ve made a bit of progress on the hinges for the loose heeled switches over the last few days. This time I’ve used 1mm glass fibre copper clad for the timbers that provide the hinge points. The main reason is to allow me to provide a solid anchor point for the switch blades to hinge from. So I drill a couple of holes in the timber, solder two 10BA nuts to the underside and then screw counter sunk bolts through from the top. These then give a nice flat surface to solder the switch blade to. The copper timber thickness is a little too thick as the ply timbers are only 0.8mm thick, so I cut away the Templot plan to allow the copper to sit a little lower and this seems to work. Any variance can be taken up by adjusting the bolt up or down. I’m aware that this approach is a bit crude, but it seems to work and is less likely to fail electrically or mechanically I feel, than say springy wire. After the stage shown in the photo above i drill right through the baseboard to allow the bolts to protrude out at the bottom underneath the baseboard. And I gap the copper clad twice to be on the safe side, top and bottom. The other end of the bolts are used to provide the track power to the blades. The resulting blades have virtually no sideways resistance which makes them an easy drive for the servo. That is good Andrew. Are you counter-sinking cheesehead bolts into the 'timber'? Can't quite see from the last pic as it a little blurred on my screen ( polite way of saying your depth of field is too small ). Could you sand the copperclad 'timber' thinner on one face to match the depth of the other timbers - you only need the copper to solder to on one side- unless you are also soldering the bolt heads to the copper.